An innovative and simple solution to storage facilities, the FRS Electronic Locker System was designed specifically for amusement parks, entertainment centres, sport venues, clubs, shopping malls and other public and semi-public areas. FRS electronic lockers are ideal in locations where visitors need to store personal belongings in a safe place for a short period of time. 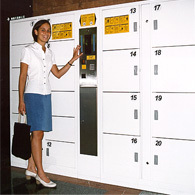 FRS security lockers are electronically controlled by a central unit which records all customer transactions and operations performed by the staff. The customers are the only ones handling their belongings, increasing their perception of security while minimizing the operational costs by reducing human interventions. The system is user-friendly and uses no key but a choice or combination of different and convenient activation modes. Instructions for use are displayed on screen in 2 languages : English and any other language including non-alphabetical languages. Flexibility in setting the pricing and rental duration. 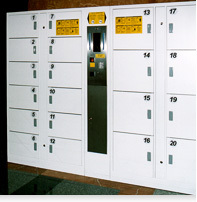 The lockers are fitted with local electronic built-in alarms which are triggered in case of break-in attempts or vandalism. Customer transactions and operations performed by the personnel are recorded and can be printed out. A battery back-up will switch on automatically in case of power failure, and can last up to 4 hours. Data are safe even in case of long power cuts..
Cash collections are monitored and an accounting status ticket can be printed at any time.